Res ipsa loquitur — “The thing speaks for itself.” I might just give y’all this table and say nothing else. Seldom will you see a week like this: silver and GOLD PRICES up 7%, platinum up 6.1%, Palladium up 5.5%, Dow in gold and Dow in Silver down 8%, Dow down only 1.4%, by the hair of the Nice Government Men’s chinny-chin-chin today, US dollar index down 1.5% (a huge move). Confidence in the financial system and central banks is crumbling like week old pecan sandies. Behold! More and stronger awaiteth. The GOLD PRICE today took a break, giving back $8.40 (0.7%) for a Comex close at $1,239.10 — $81.30 higher than last week’s close. The SILVER PRICE shaved off 4/10 of 1¢ to $15.785. The price of gold has cleanly broken out on its monthly chart. Likewise on the Weekly chart, breaking through the 150 week MA and the 50 week MA, Silver’s monthly chart has not quite crossed the 20 WMA but is knocking on the post-2011 downtrend line. On the weekly, silver has broken above the post-2012 downtrend line and the 50 WMA. The silver and gold price run ain’t near about over. Look for gold to reach $1,300 – $1,350 before it rests. Silver should reach $17.00. Big jump up in GOLD/SILVER RATIO to near the 80 and the top of the trading range offers us a chance to cash in on silver’s greater volatility and future outperformance by swapping gold for silver now, at a ratio of 78.1 oz of silver to one oz of gold, and swapping back when it reaches 30:1 (30 oz of silver buys one oz of gold). We won’t capture all of that move of course, but theoretically it promises to increase gold ounces by 2.6 times. One word to the wise before today’s markets: never forget that gold and silver are severely undervalued from an historical (centuries) standpoint, and that even at these low prices, the physical gold and silver markets are tiny. The door into gold and silver is simply too low and narrow to accommodate great crowds. When everybody tries to walk through at once, some get crushed, some get left out, and some get nothing — witness the 2008 panic when silver premiums shot up to 50% and more over melt, and deliveries on silver and gold stretched out 8 weeks or more. Mercy, silver deliveries were delayed during 5 months this summer and fall, stretching out as long as 12 weeks. Product is not there, smelting capacity is not there, dealer network is small. Don’t expect to wait till some crisis hits to buy your silver and gold. One other word to the wise: the gold and silver industry is filled with crooks — companies that hire slick salesmen with persuasive patter to sell grossly overpriced items. Typically they mark up obscure products 45% so they can pay a salesman 25%. Compare that to bullion dealers who charge commissions of 3.5% to 1% over wholesale. FORGET buying fancy modern “rarities” and proof American Eagles and numismatic (collector’s) coins. If you want to hedge monetary risk, stick with bullion-type gold or silver, coins or bars. One more thing: karatage on a bullion gold coin doesn’t meandoodle. 21.6 karat or 22 karat is just as good as 24 karat, period. Be very careful before you buy gold and silver. This week slammed the door. Gold broke out on record volume through 4-1/2 year resistance lines on monthly and weekly charts. 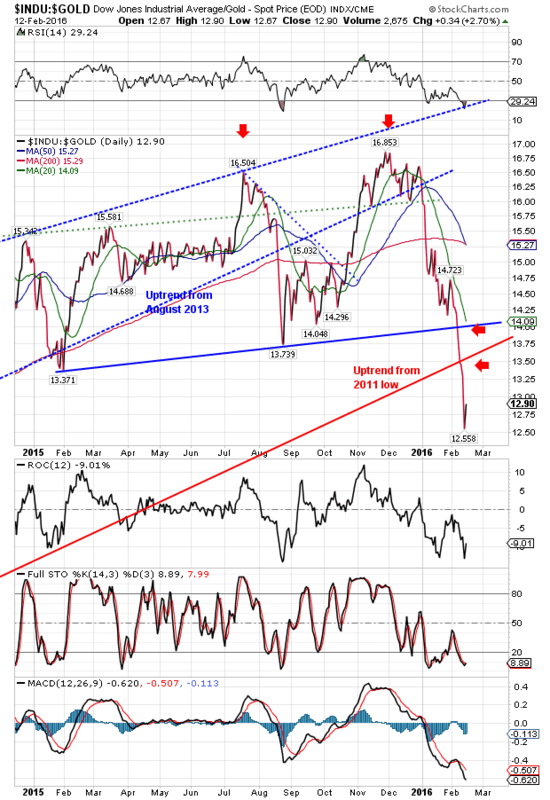 Dow in gold and Dow in silver have broken down through their uptrend lines from 2011. Dollar has avalanched down through long-standing support. 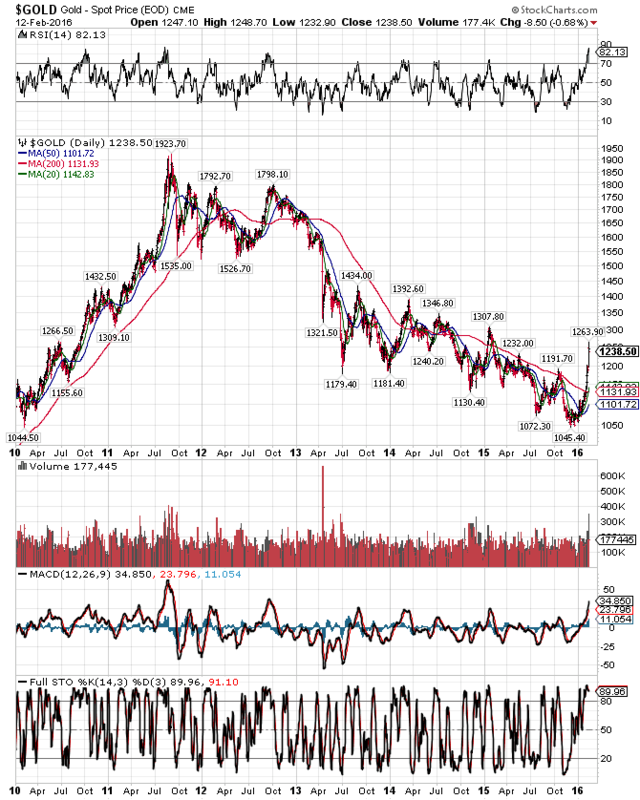 The Great Shift of money out of stocks and into gold and silver I thought we saw in the Dow in Gold chart has now been confirmed and re-confirmed. 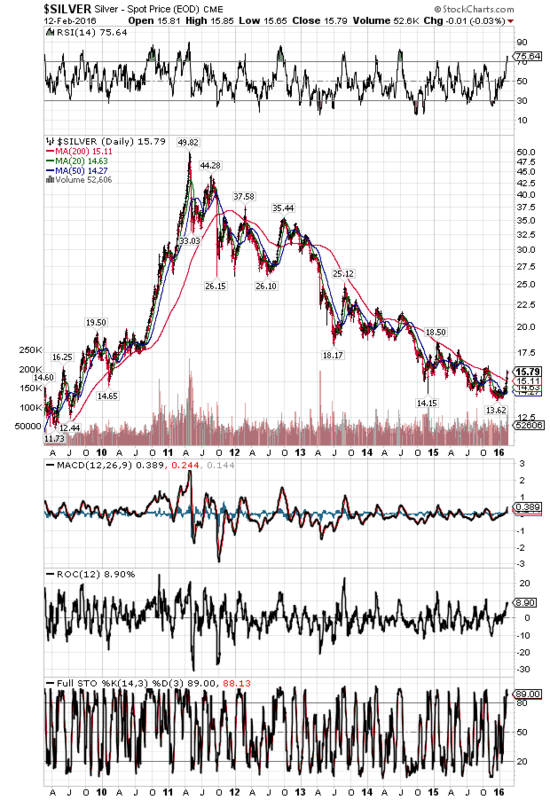 The long correction in silver and gold has ended. Now is the time to buy. Speaking of “bull” and “Bear” markets I may have confused y’all. In strict usage — which the financial media does not observe — a bull market is a primary up trend that last 15 – 20 years (bear is a 15-20 year primary downtrend.) A stock bull market died in 2000 and a bear market began, although stocks were goosed after 2008 by new Fed money. Gold entered a new bull market in 1999 and silver in 2001. But what about the last 4-1/2 years’ correction? Every bull market has a mid-life crisis that lasts long enough for the unwary to call it a bear market. After the mid-life crisis, the bull phase resumes and tends to outperform its first half. From 1999 – 2011 gold rose 7.5 times and silver 12.5 times. 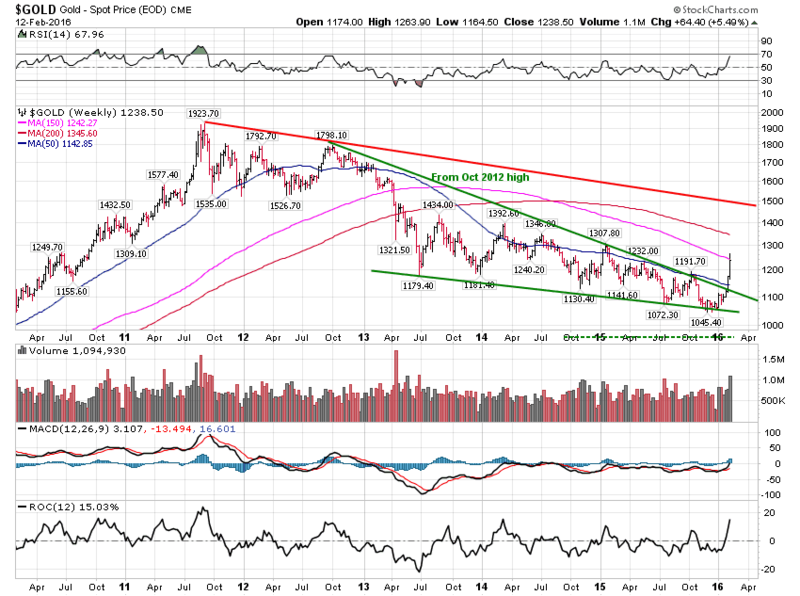 From their $1,045 and $13.62 correction lows, I expect gold and silver to outperform that earlier run. Y’all are smart: do the math yourselves. 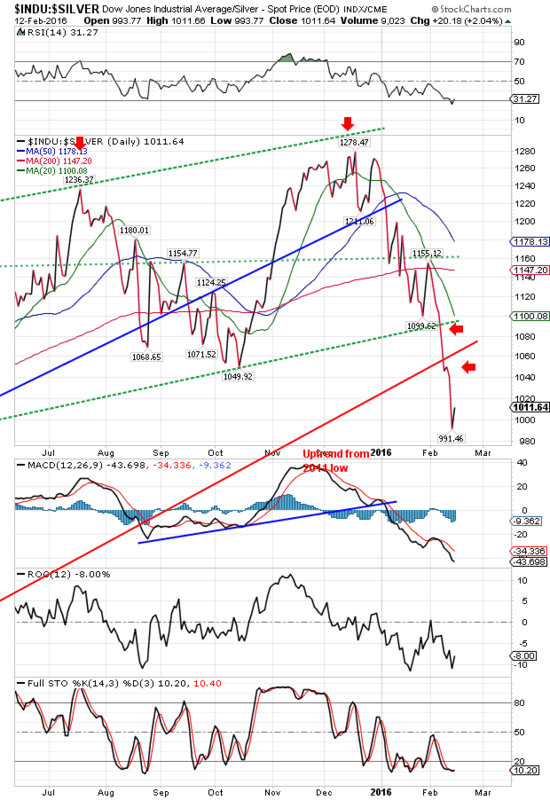 We’ve seen stocks react up in an A-wave (mid January to 1 Feb), then collapse in a B-wave, and now they OUGHT to mount a C-wave up before collapsing again. When brokers tout their own position, it’s called “talking your book.” They’re trying to convince others to do something to help their own position. Ultimate “talking your book” event came today when Jamie Dimon, Chmn. of JPMorgan Chase, announced he bought 500,000 shares of JPM yesterday. At yesterday’s $53 close, that’s 26.5 million, almost as much as his $27 million pay for 2015. Naww, he ain’t talking his book. Dow in gold rose 2.7% to 12.90 oz (G$266.67 gold dollars) but has smashed all support and the uptrend form the 2011 low. Dow in silver added 2.04% to end at 1,011.64 ($1,307.98 silver dollars) after breaking 1,000 oz this week with a 991.46 oz low. Both indicators will rise if stocks mount that C-wave, maybe to the post-2011 trendline, maybe further. Mattereth not a whit, the threads of their fate have been measured and cut, and, will-they, nill-they, down they will descend in their primary trend. US dollar today bounced up, after falling 8 of the last 10 days. Closed 95.95, up 35 basis points or 0.38%. Might trampoline off 95.50 support for a rally here, but that rally won’t signal a trend change if it can’t cut through the 50 day moving average, now 98.31. The doctor gave my wife Susan a salve for her eye that has helped tame the pain, but leaves her looking at the world through Vaseline. Just takes time, he says. I say, y’all please keep on praying for her.